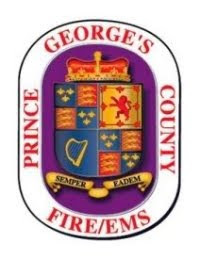 The Prince George’s County Fire/Emergency Medical Services (EMS) Department recently held three groundbreaking for new public safety facilities. Construction for all three facilities is scheduled to start in 2017 with completion in 2018. The Oxon Hill Community Fire/EMS Station #851 is slated to be a 4-bay design similar to other recently constructed County facilities such as Brandywine, St. Joes, Northview and District Heights. Construction will start in 2017 with a completion date projected in late 2018. The Oxon Hill Community Fire/EMS Station is slated to house an engine, ladder, truck, ambulance and Battalion Chief. To see a video of this groundbreaking ceremony click here. Additional images of this event can be viewed here. On Tuesday, November 22, County Executive Rushern L. Baker III joined public safety leaders Mark Magaw, Deputy Chief Administrative Officer for Public Safety; Marc Bashoor, Fire Chief; and Hank Stawinski, Police Chief in breaking ground for a new Public Safety Pier at National Harbor in Oxon Hill. This project will provide a launching point for fire, EMS and public safety watercraft. Many thanks to the Peterson Companies and Chris Borgal for partnering with us. To watch a video of this groundbreaking event click here. For images click here. On Thursday, December 1, a Groundbreaking event was held for the new Shady Glen Fire/EMS Station. This new facility will be a replacement for the Seat Pleasant Fire/EMS Station. To watch a video of this groundbreaking event click here. For images from this event click here. The Prince George's County Fire/Emergency Medical Services Department is proud to announce the following promotions. These promotions were effective November, 27. Congratulations to these individuals for earning these promotions through study, hard work and determination!!! Fire Fighter Patrice Davis was presented with a "Fire Chiefs Award" today, Friday, December 2. Fire Chief Marc Bashoor presented Davis with the award based on a very favorable recommendation by retired Assistant Fire Chief Steve White. 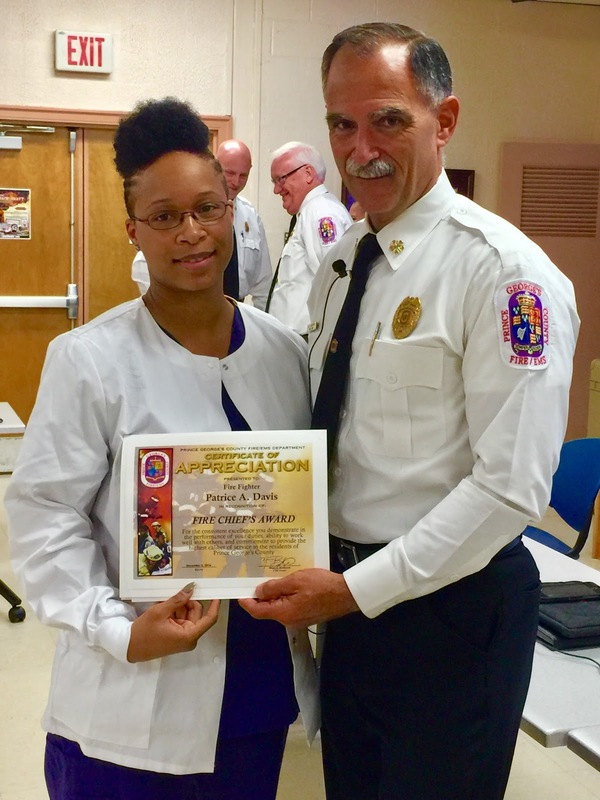 The award was presented during a Departmental Staff Meeting at the Fire Services Building in Landover Hills, Maryland. It has been my pleasure working with Fire Fighter Davis, who is assigned to the Watch Office on B-shift. She has continually gone above and beyond her normal duties in this assignment and works diligently to ensure the Command Log, Smoke Detector reports, and other reports are accurate and complete. She is professional and takes great pride in making timely notifications and communicating precise information. As an example of Fire Fighter Davis’ diligent work efforts, there was a large influx of smoke detector requests. For a couple of days the list of more than 150 requests was unorganized and difficult to decipher. Upon arriving for her shift, Fire Fighter Davis took the initiative to organize the list and make sure each Battalion Chief had all the information needed to move forward in the completion of each request. The compilation and organization of the large amount of requests made the process of replying accurately much easier on both the Battalion Chiefs and field personnel. This type of self-motivation is what makes Fire Fighter Davis such an invaluable asset to B-shift, the Watch Office, and the Fire/EMS Department as a whole. The consistent excellence you demonstrate in the performance of your duties, ability to work well with others, and commitment to provide the highest caliber of service to the residents of Prince George’s County are admirable and worthy of recognition. Your efforts distinguish you as a positive role model for your peers and a valued member of our Department. For these reasons you are hereby awarded the Fire Chief’s Award.